Places to Run – Which contains a list of both paved and dirt trails, offering up maps, pictures, and additional information on all of them. Points of Interest – A list of different places to check out throughout the park. The most obvious and most widely used trail is simply called the “Rock Creek Trail,” which is a paved path running most of the length of the park. You can divide the trail into two sections, the Southern section, which is it’s own path, and the Northern section, which joins Beach Drive. The Southern Section (~5 miles) – The southern section runs from Pierce Mill (intersection of Tilden and Beach Dr. NW) down to the Memorial Bridge. The paved path winds its way down the park, for the most part sticking pretty close to both the creek and Beach Drive. There are a few sections where it veers away from the road, in particular around the zoo, a nice wooded section that follows right next to the creek. The path can get pretty crowded during the weekends, especially during the summer, with tons of runners and bikers trying to get by each other. While it is plenty big enough for two bikes or runners to pass, when it is crowded passing can get a bit messy. In addition, the pavement itself is in pretty rough shape. I love running the RCT early Saturday or Sunday mornings, before it gets too crowded. It is a prime spot for marathon training during the summer, so you’ll see tons of people out there logging long runs just like yourself. Pierce Mill up to the Maryland Border. Portions of the northern half are on a path similar to the southern section, but most of the time you will be directly on Beach Drive. While I would never recommend running on Beach Drive while cars are on the road, this section is closed to cars every Saturday-Sunday and Holidays from 7:00 a.m. to 7:00 p.m. Beach Drive (north of Tilden) is a fantastic place to run or ride on the weekends. Because it is wider than the path, you have plenty of space to open up your stride and get into a rhythm. As stated above in the ‘Northern Section’, Beach Drive north of Tilden Street and between Military Road and Broad Branch Road is closed to cars on weekends and holidays from 7:00 a.m. to 7:00 p.m. This is a great place to run, bike, or skate with plenty of nice pavement, beautiful views, and open space. See ‘Northern Section’ above for more detail. Places of Interest Along RCT and Beach Drive: Intersection with the C&O Canal Trail in Georgetown. RCT intersects right after you go under the Pennsylvania Ave. bridge, or just south of M St. Exercise Course (Video, other source): The exercise course starts just down the hill of Calvert and Connecticut, NW, near the Woodly Park Metro. About 1.5 miles in length, it provides a series of workout stations. See the video for the full list. Intersection with the C&O Canal Trail in Georgetown. RCT intersects right after you go under the Pennsylvania Ave. bridge, or just south of M St. Parking: Parking can be found at several places throughout the park, especially around picnic areas on Beach Drive. Use the official Park Service Map to locate a picnic area near your intended starting point. 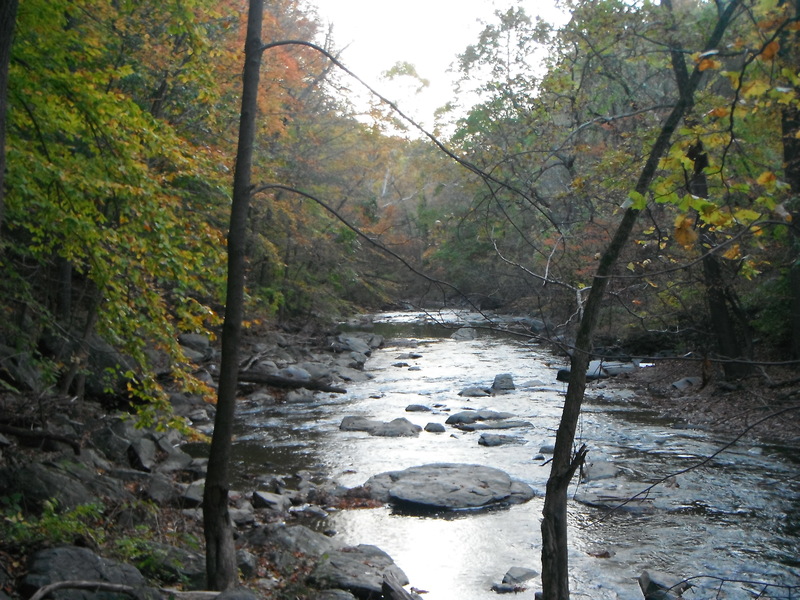 Western Ridge Trail is one of the more popular hiking trails through Rock Creek Park. Offering just under 5 miles of trail, this route will take you up and down the ridges offering views of the river and surrounding area. The trail itself switches a few times between hiking and biking during the first few miles, then ultimately to a shared hiking/horse trail for the last third or so. For the most part the trail is well marked and well defined, with moderate terrain. Once you move past the first section, the trail widens a bit with better footing. This is a great trail if you are new to trail running, especially the section between picnic area 28 and Military Road. 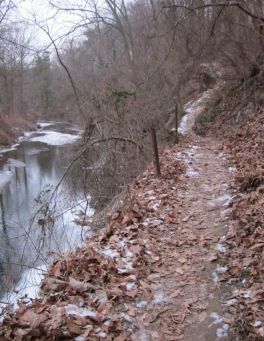 This wonderful trail runs along Rock Creek up to the Maryland border for about 5.6 Miles, but don’t be fooled by the word “Valley” in its name. The trail has plenty of elevation change as it twists and turns along side the river. Contrary to the Western Ridge Trail, the Vally Trail’s path is a bit more rugged. Watch your footing for rocks, roots and narrow passages. While you’ll find fewer runners along the Valley trail, this is probably the most popular hiking trail in the park, and a great place to see wildlife like deer and black snakes. C & O Canal Trail (map) – The Chesapeake and Ohio Canal Trail runs 184.5 miles along the Potomac River from Washington, DC to Cumberland, MD. This is an extremely popular trail for both bikers and runners, as it is very well kept and consists of a mostly crushed stone surface. It’s because of this trail that many DC runners are actually trail runners and don’t know it! I used to do a 7 miles stretch of this trail as part of any 13+ mile run during training. It is a very pleasant stretch with the old canal on one side and the Potomac on the other. C&O Miles 0-10 (map): While the trail isn’t located in Rock Creek Park, you can easily pick it up right from the Rock Creek Trail. You can access it from the Rock Creek Trail just after passing under (going south) the Pennsylvania Ave. bridge. After running the brick sidewalk through Georgetown, you will reach the actual path and boy is it flat. This stretch is wildly popular on a weekend morning for marathon trainers, weekend joggers, and the like. During the summer you’ll pass several impromptu aid stations from Team In Training and other similar training groups. If you look out on the water, you’ll often see crew teams doing their morning workouts, and kayakers playing around. While you don’t really need to worry about footing along this trail, it is a great way to get off a road, into a bit of wilderness, and a good way to help save those legs and refresh the mind. 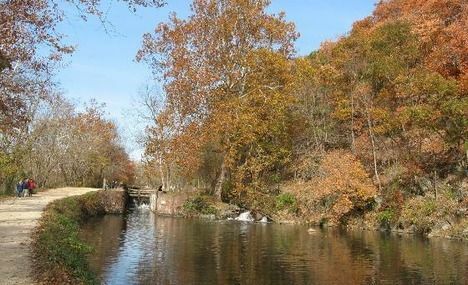 If you aren’t on Rock Creek Trail, you can access the C&O path by traveling as far south as you can go from just about any street in Georgetown. 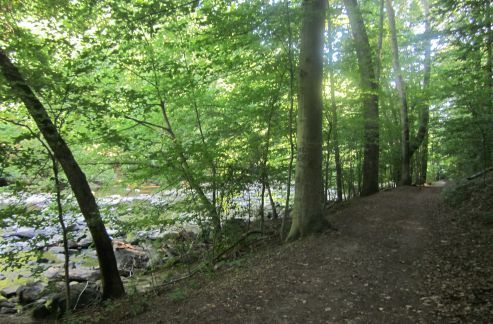 Melvin Hazen Trail and Glover Archbold Park (map) – While this trail starts and ends in Rock Creek Park, the loop I have mapped out here takes a detour into Glover Archbold Park for some nice trail outside of Rock Creek but inside the District. To start the Melvin Hazen Trail, leave from the picnic pavilions located at Peirce Mill. 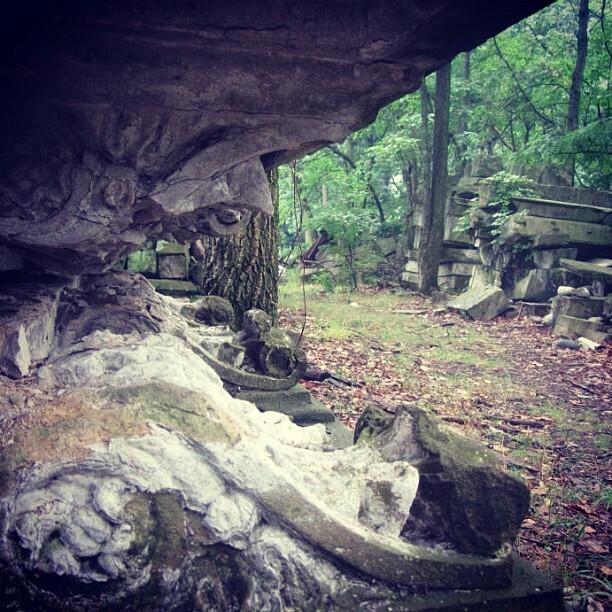 Head directly into the woods behind the pavilions following a creek up the valley. Note that this area can get flooded after heavy rains, making the creek crossing a bit difficult. After about .5 miles you’ll hit Connecticut Ave. Cross the street and head down Rodman St. for about a block before dipping back into the woods. After following that trail up to Reno Rd. you have to do a bit of sidewalk running. From here you should follow this map for the best directions. After a bit on the road, you’ll drop back onto dirt and into Glover Archbold Park. This is a fun stretch of trail, and probably one of the most heavily used dirt trails in DC, full of runners from Georgetown and the surrounding neighborhoods. You can take Glover Archbold Trail all the way down to the C&O Canal Trail or you can turn off and head back into Rock Creek Park. This Map has you dropping back into Rock Creek. 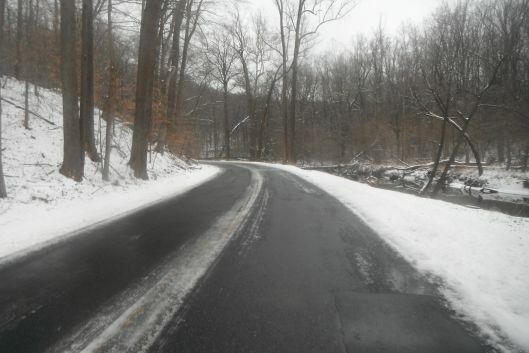 Rock Creek Park is home to 13 miles of horse trails, offering up nice smooth dirt trails with much easier footing than you’ll find on hiking trails like the Valley Trail. Unsurprisingly, most of those trails can be found around the Horse Center area. Some serve as connectors to other main trails, while others run independently along the creek or through the woods. On the map to the right, the horse trails are marked as “_ _ _ _ _”. Probably the most popular horse trail for runners runs directly on the west side of Rock Creek between where Beech Drive turns into a no car zone on the weekends (South) and Military Road (North). This trail can be found on the map to the right by starting right there at the southern point of yellow and running up along the creek to Military Road. This section is pretty flat, very smooth, and beautiful. A great place to open up your stride and get in some real tempo on the trail. This is a great place for beginners to trail running, and even offers a few bridges that cross the creek back onto Beach Drive if you feel like ducking out. If you make a left on the trail about half a mile from the trail head, you will run into the leftover Capitol Stones mentioned below.